If you’re interacting with Sopris, you’re probably seeing/hearing the word Platformation™ used in context with digital transformation. In this post, we’ll dive into Platformation™ and the value we believe it brings to platform-based businesses. To do so, I’ll back up and give you our take on “digital transformation”, which lies at the heart of Platformation. This is a term that gets thrown around a lot by technology companies and more often than not, misused. Digital Transformation is a journey taken by an organization to fundamentally change the way they deliver products and services to include a focus on modern, digital solutions. It’s about utilizing data to improve the customer experience and make better decisions. Most importantly, it is about creating real relationships through a digital medium. As far back as 2015, the Global Center for Digital Business Transformation states that “organizational change is the foundation of digital business transformation”. Notice the focus on organizational change as the foundation. Technology is an important ingredient, but more a means to an end. Customers, suppliers and employees have changed dramatically over the last 10 years in the way they interact. Growing up in a connected world, people are not only comfortable with a “digital relationship” … they expect it. That doesn’t mean people don’t also expect to interact directly, over the phone or in person. But, they do expect that a partner relationship can be created and carried out virtually. The same goes for how people interact and make decisions within a company. How often do you Skype someone who sits 15 feet away? How many business relationships do you have with people you’ve never met? How often do you make decisions about customer interactions, plant operations or field services without ever directly participating in those activities? Face it. It happens all the time. In a recent study from MIT’s Sloan Institute, 90% of global managers and executives expected “moderate” or “great” industry change through technological advantages, but only 40% of those same executives said their organizations were prepared for it. In fact, despite having access to magnitudes of information, nearly 30% of surveyed leaders don’t use KPIs to drive change in their organizations. In a nutshell, most companies today need to be just as comfortable operating in the digital world as in the physical world. Success is in finding the right balance and optimizing these channels to be more productive, profitable, competitive and secure. A commitment to digital transformation must exist at an organizational level before technology changes will have the desired impact. Nowhere is this more important than in platform-based businesses. So, what is a Platform-Based Business? There are many ways a company might embrace digital transformation. For some, it is just an evolution of their current business model. For others, it may mean wholesale change. More often today, we see companies created as a “digital enterprise” from the outset. These are often considered Platform-Based Businesses. Platform-Based Business Model (PBBM) Defined: A business based on enabling value by creating interactions between external producers and consumers. The Platform-Based Business Model isn’t a new idea. Frankly, any formal marketplace that brings consumers and producers together could be considered a platform-based business. Malls, auctions and other exchanges are common examples. Today, the platform has become even more important as B2B and B2C interaction online becomes more prevalent. The digital platform isn’t only for expanding the footprint, it is often fundamental to the business itself. So where does Platformation fit in? Platformation is a term coined by Srikar Reddy, CEO and Managing Director of our parent company, Sonata Software. The goal of Platformation is to help businesses move towards a platform-based business model (PBBM), but particularly where that platform is focused on data and digital interactions like social, IoT, mobile and the cloud. The platform provides an open, participative infrastructure for these interactions and sets governance conditions for them. Digital Platforms are revolutionizing the way we do business. Traditional business models are linear in structure with inputs at one end and output at the other. Unlike the linear mode of generating and consuming value in the pipe model, platforms serve as an ecosystem of value generation and consumption. They create value by tapping into resources that they don’t need to own. The shift from the linear, resource-heavy, producer-driven pipe model to a demand-driven, circular networked model is enabling four big outcomes for enterprises – flexibility, scalability, mobility, and availability, through collaboration of diverse participants. Platformation ushers in true digital capability and transforms the traditional enterprises to operate the way ‘born digital’ companies like Amazon, Netflix and the host of ‘click’ companies which have created a very successful digital business in a very short span of time. 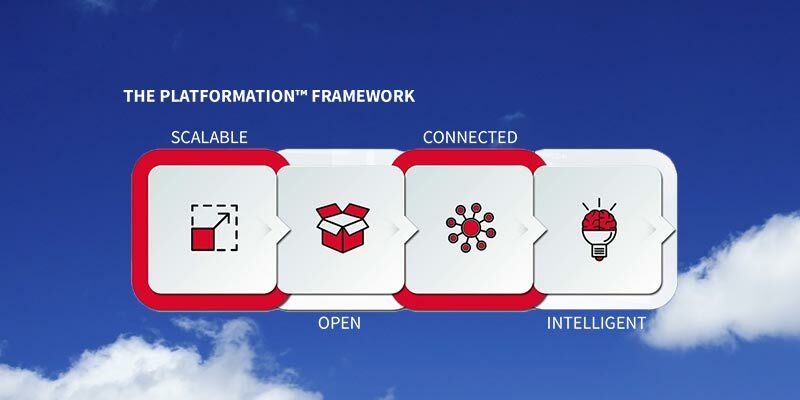 Platformation is an approach to digital transformation that minimizes complexity and takes on a systematic approach to building digital platforms. Be sure to subscribe to our blog as I’ll be breaking down Platformation, Digital Transformation, Digital Business and yes…related cloud technology…in future posts.